White Nissan Maxima with expired sticker (01-18) has been parked near the mailboxes forever taking up a guest spot. License plate number IKA 032. Make a right when you pull into the complex and the car is on your left right after the mailboxes. This has been sitting in the driveway for a many weeks. 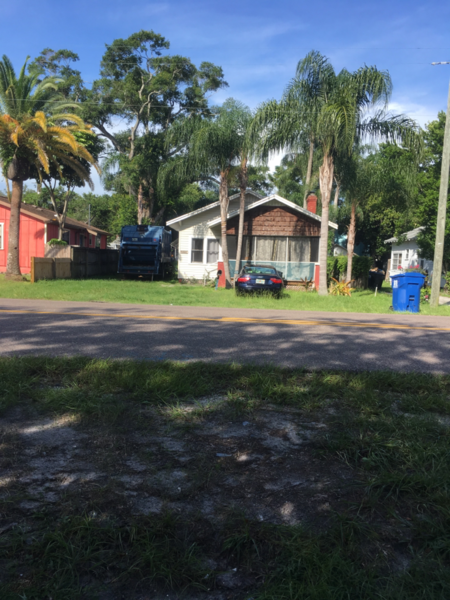 Parking in front yard, evenings and weekends, 3530 Haines Rd N.
3530 haines rd. Front yard parking. Gold Mercedes with no tag abadoned in back parking lot of the Shoppes at the Royale on 66th Street and 13th Avenue North. Vehicle has been abadoned for months at this location. boat continues to be parked in Street. this has been reported too many times. the article in the paper said your new statistics are supposed to hold the city accountable but if you the city does not hold yourself accountable what is the point? : how is city held accountable after this has been reported with codes and the police a tremendous number of times? If you are going to report it, cite the code. Is that red car parked behind it illegal too? Takes the same space as a vehicle. Looks like it, and also it is parked in front of a drive way. Could have been the photographers car. ;..What do you think. Should he get a ticket too? No way to know from the picture if the red cars owner lives at that driveway. Life is short, if a boat takes the same space as a car in front of a residence that has no driveway option, what harm is it? Park the boat in the yard behind some bushes and park a car in it's place on the street - what is the difference? This home is falling apart. Vegetation has consumed the wire fence between my home and the abandoned home. The houses roof has opened up and has debris falling into my yard. The house gives off a smell randomly, has mold and vegetation is as high as the roof of the house. This issue has been reported to the City of St. Petersburg in June 2018. This property has been remodeling the entire kitchen for over four months. The owner will claim that only cabinets are being replaced, clearly untrue. We have experienced the usage of wet and dry saws on early weekend mornings, shelving from the garage propped up on the back of the house for two months, storage bins from the house in the back yard, etc. Overgrown weeds back of property at 777 29th Ave N . Against fence to alley right of way.